Before the end of his first term in office, the Obama administration expanded a small program by about 3,600 percent. 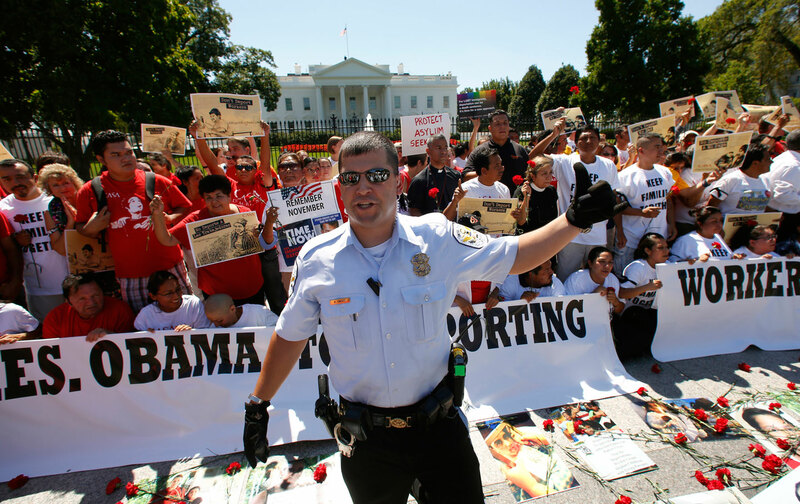 When Barack Obama took office after his 2008 election, he inherited a budding deportation apparatus with its roots in the imagination of the “War on Terror” reactionaries who created the Office of Homeland Security in 2001 (later the Department of Homeland Security). When he leaves office he will leave behind to his successor the most sophisticated and well-funded human-expulsion machine in the history of the country. In his first two years, newly appointed Director of the Office of Homeland Security Tom Ridge expanded the purview of his department to include an immigration enforcement plan that sought to achieve a “100% removal rate” of the undocumented population in the United States by seeing to the drafting of a document that came to shape the next 15 years, “ENDGAME Office of Detention and Removal Strategic Plan.” At the time, the Immigration and Naturalization Service (later broken up into the Citizenship and Immigration Services, Immigration and Customs Enforcement, and Customs and Border Protection) had approximately 26,000 agents and $4.9 billion. It was an enormous leap from when ICE was previously housed within Department of Justice but nothing like what it grew to be today. Instead of reversing that architecture and disavowing that plan, President Obama turbocharged it. To pay for the ballooning enforcement-first approach, the budget for immigration enforcement grew 300 percent from the resources given at the time of its founding under Bush to $18 billion annually, more than all other federal law-enforcement agencies’ budget combined. Before the end of his first term in office, the Obama administration had taken a small program developed in George W. Bush’s last days that aimed to turn local police into “force multipliers” and expanded it by about 3,600 percent. The Secure Communities program that DHS Secretary Jeh Charles Johnson described as causing “hostility to enforcement of immigration laws” existed in only 14 counties under Bush, but by the end of 2009 it spread to 88 counties. By 2013, it was active in all 3,181 US jurisdictions. It was eventually scrapped in 2014 and replaced with a rebranded Priority Enforcement Program. As record numbers of people were being deported, an increasing number were also charged and channeled into federal prison before their expulsion. Within two years of coming into office, President Obama doubled the number of people being prosecuted for reentry by expanding Bush’s border-court system, Operation Streamline, which tries up to 70 people per day in a cattle line of sentences. The experiment went from three jurisdictions in 2008 to every single border sector except California by 2010. From the time of its invention in 2005 to just four years later in 2009, Streamline sent over 209,000 individuals to serve federal prison sentences for no reason other than crossing the border. To carry out the plans laid out in ENDGAME, DHS would become the largest law-enforcement agency in the country, with more than 48,000 personnel dedicated to immigration enforcement alone. At the same time, the Obama administration worked to craft an image of being smart as well as hard on enforcement. It has promoted concepts of prosecutorial discretion to narrow the targeting of its resources and established the temporary-relief program, deferred action, to further define who faces the threat of removal. However, the implementation of such mechanisms and President Obama’s professed support for immigration-reform legislation does not alter the massive net the president has sewn to ensnare the undocumented community. By April 2014, immigration authorities scanned a total of 32 million sets of fingerprints, a number three times the undocumented population and equivalent to 10 percent of the entire US population. In fiscal year 2012, the height of its deportation quota pursuit, ICE processed 9 million prints, matching 436,000 submitted by local law enforcement, and issued detainers (a practice largely abandoned now due to constitutional concerns) for over a quarter-million of those it identified. With such far-reaching capacity, whether deportation numbers spike or drop under an administration is a question of opening or closing the faucet on what has become a well-oiled removal pipeline. Whether it is flowing rapidly or cut to a trickle is a choice of the person in charge, and will be a choice presented to President Obama’s successor. As Obama enters his final months, some say the record deportations he oversaw and the raids against refugees mothers and children already seal his legacy as the deporter-in-chief, while others had argued that a positive ruling to expand deferred action in the Supreme Court this summer could have somehow redeemed it. However, a different measure will be comparing what he inherited to that which he’ll pass to whoever comes next. With the prospect of a Trump presidency overseeing future DHS activity, the most important decision the president has on immigration is yet to come. Will Obama dismantle the astronomical capacity to capture immigrants he created during his presidency, or risk handing over the reigns of a dragnet at-the-ready to the man who’s promised to surpass him in using it? Marisa FrancoMarisa Franco is the director of Mijente. Carlos GarciaCarlos Garcia is the director of Puente Human Rights Movement.